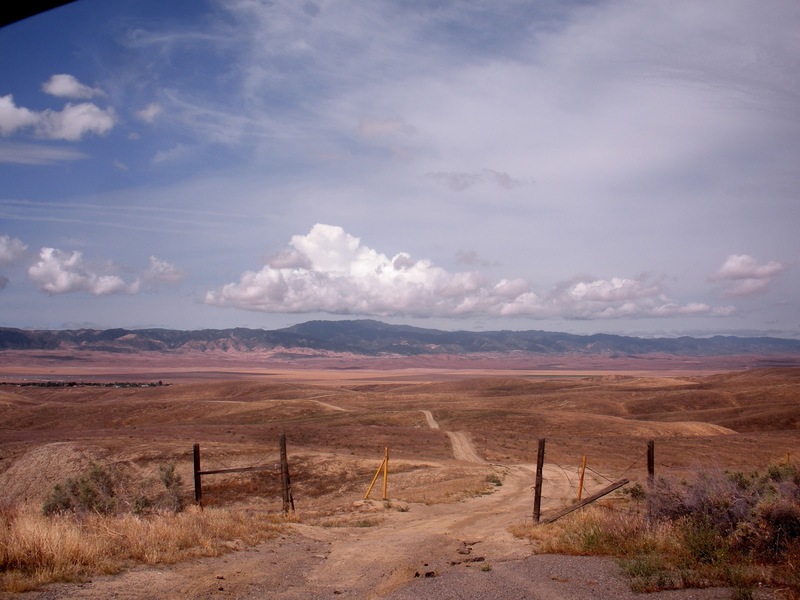 Central California Soaring Association: SATURDAY, May 7, 2016. Riviera, Egorov, and Rain. SATURDAY, May 7, 2016. Riviera, Egorov, and Rain. Visibility: Underneath the overcast, unlimited. Time Aloft: about an hour. Max Lift: 8-10 kts. very infrequently. Temperature: Cooler than normal. Freezing in the back seat of the 2-33 at altitude. 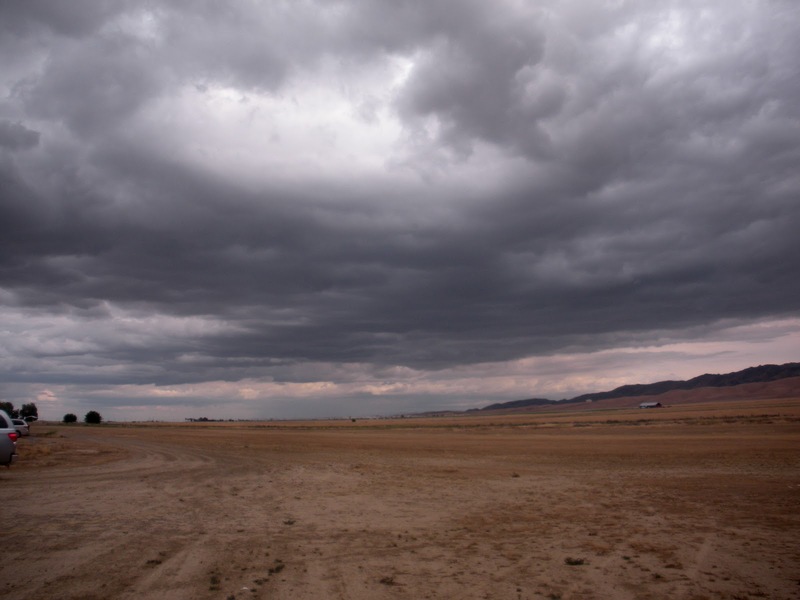 Comment: The rain showed up later, after all flights concluded. Tow pilot: Jim Rickey mostly, Harold once for Jim Rickey. Very slow day. Few showed up and fewer still were the number of flights. I guess the threat of weather kept most away but the runway was completely dry, and the rain, although threatening just to the west, never made it to the field until early evening. 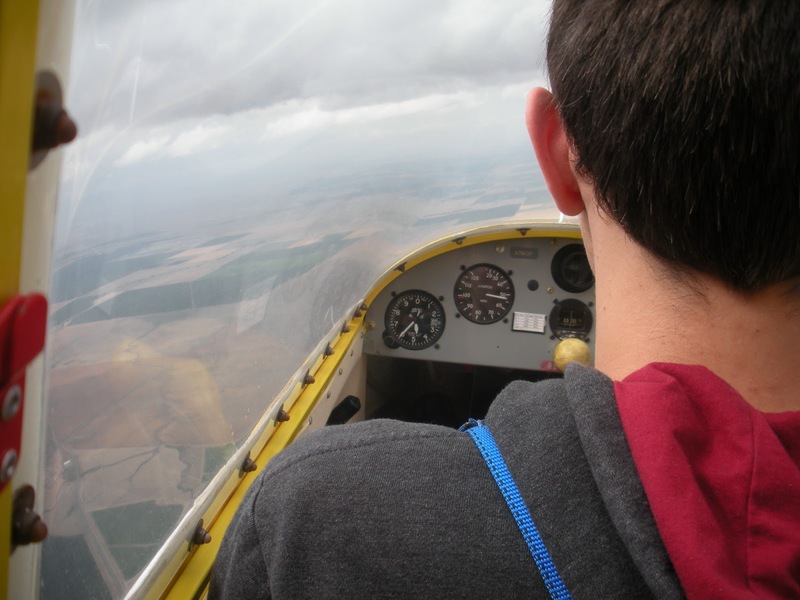 Staying up was no problem, although early on the thermals were being broken up, or too narrow, or just plain ragged. Later they turned stronger and more predictable, reaching high levels of lift. Black Mountain from Rte 269 over the K-Hills at 10:46 am. First up today was Joaquin Riviera from Merced who has been intrigued by the possibility of motorless flight. He knows it well, at least from an RC point of view. 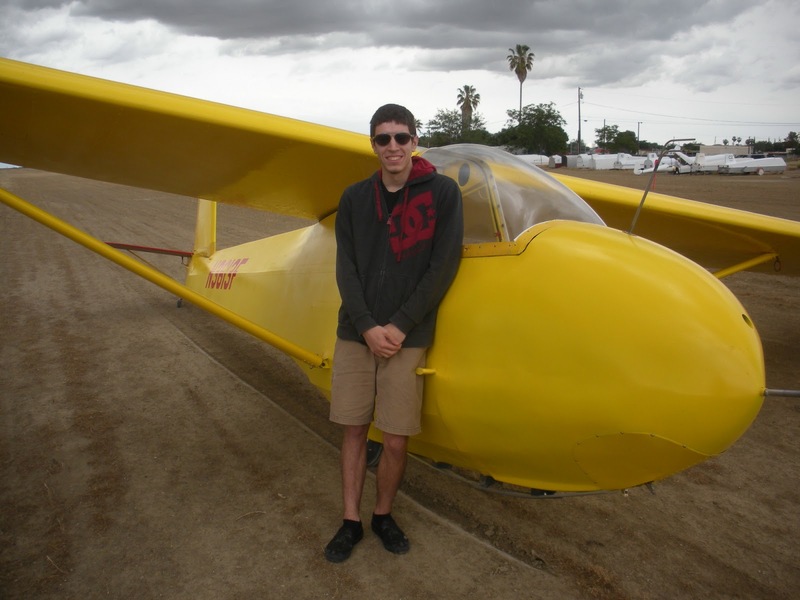 He's been flying Radio Controlled aircraft, both gliders and power planes for a long time. 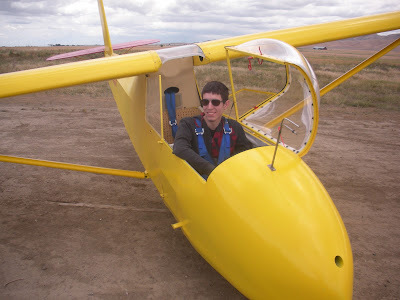 Finally he decided to come out and get in a glider just to see what it is like. He had fun, thermalled a few times, saw how lift appears, then disappears, how one can be climbing one minute, then descending the next. 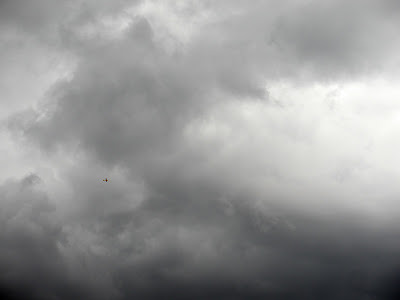 Perhaps Joaquin will decide get his Private Pilot's license and join the club. His control was very good and he should take to glider flying with ease. Sorry no photo of Joaquin but maybe next time. Mike Paoli helping Dan Clark rig the DG100. Tailwheel was low and prevented his flight. Joshua Egorov about to take his second training flight. On his third flight, Joshua did really well thermaling up to 4800 msl. 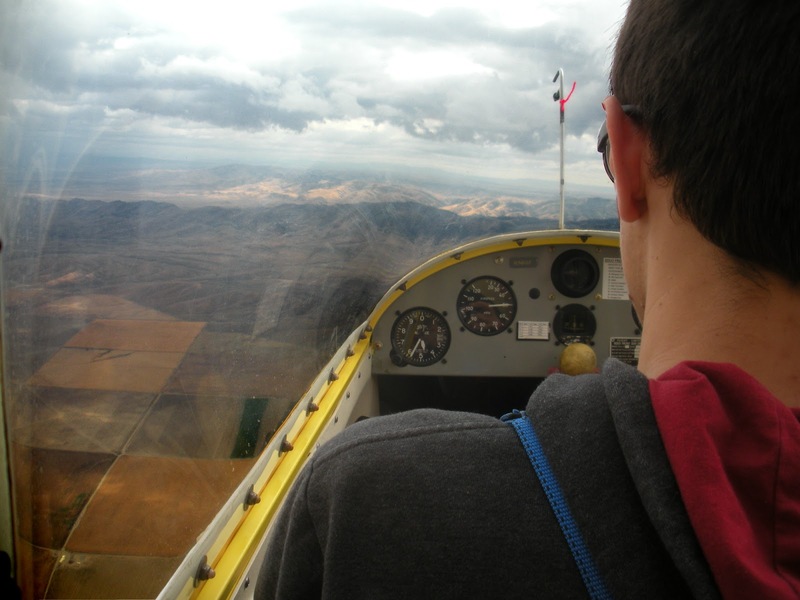 Joshua is nearing cloud base so we lingered at that altitude while practicing his stick/rudder coordination. A nice 4 knot thermal kept him busy while I took pictures. 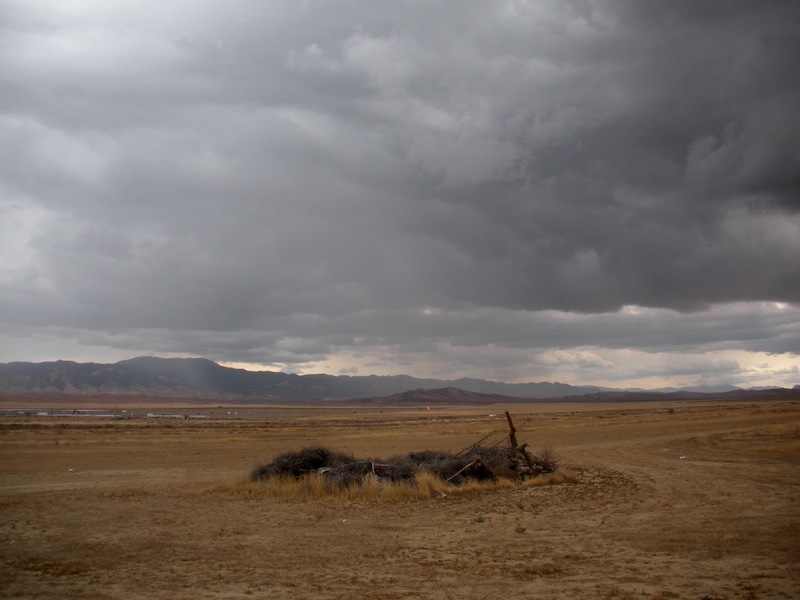 The landscape was alternately sunny and overcast. It overdeveloped and stayed that way. 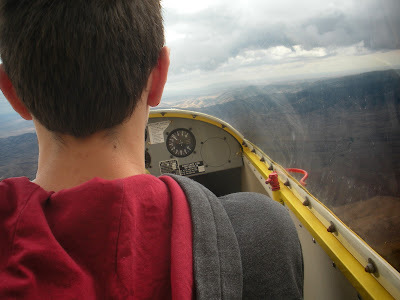 Joshua's best flight, 54 minutes and 4800 msl, on only his third training flight. Looking southeast the sky was much the same, with heavy rain in the distance. 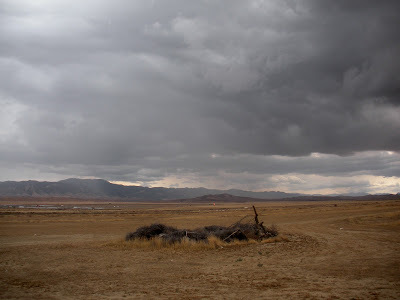 It was also raining just this side of Black Mountain and a few sprinkles made it to the field. 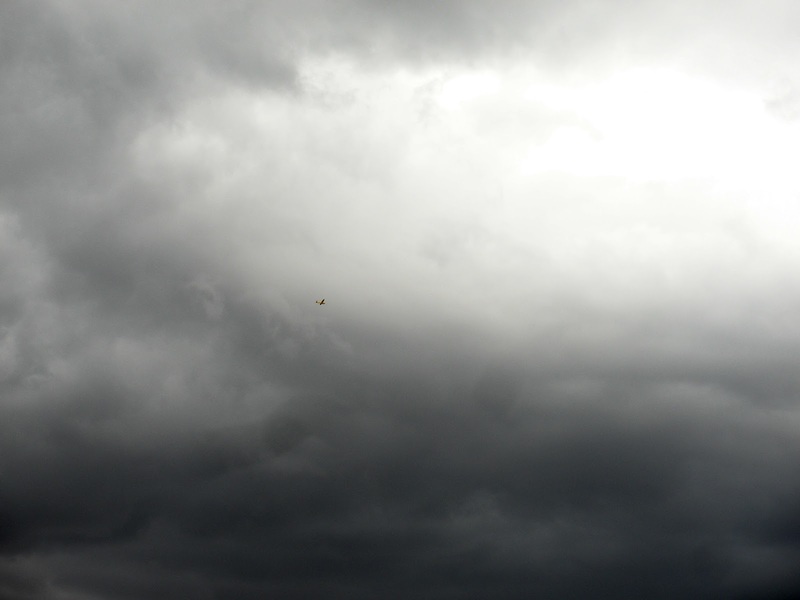 Walking out to Big Bird to fly it, I thought I felt a droplet, and after a few more, there was no "thinking" about it. Sprinkles were obvious on the canopy. Could see that rain had pushed over Black. Do I take a quick flight, or just pull Big Bird to its tie-down and secure it? Fly it! Keep a watch out for heavier rain coming the way of the gliderport. Really didn't think it would be an issue of a soggy field, as the flight was not expected to be long enough for the rain to arrive.. While on tow I had noticed the best rate of climb to be at the northwest corner of town. Harold had me there at 2800' MSL, and I released. Took time to find it after release, but found a line about a mile long, on the west edge of town. Worked it back and forth several times. Was able to stay right around 2400' MSL. With the gliderport right under me, smooth lift, cool temperatures, all other aircraft on the ground, I was good. The last southbound pass I felt the lift going off towards the southeast, so I followed it, almost to the solar farm southeast of town. Another steep 210º right, 30º left turn and was able to stay in the east-west line, also about a mile long, on the north edge of the sand drags. Worked it for a few passes back and forth, peaking at a (whopping!) 3100' MSL. 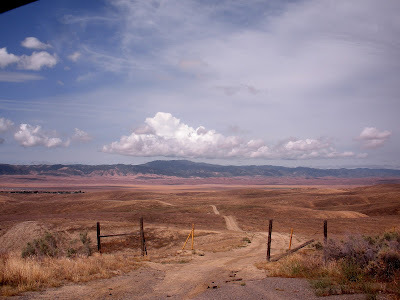 That line died out, so I went back to the first line on the west edge of town, but I did not find anything. 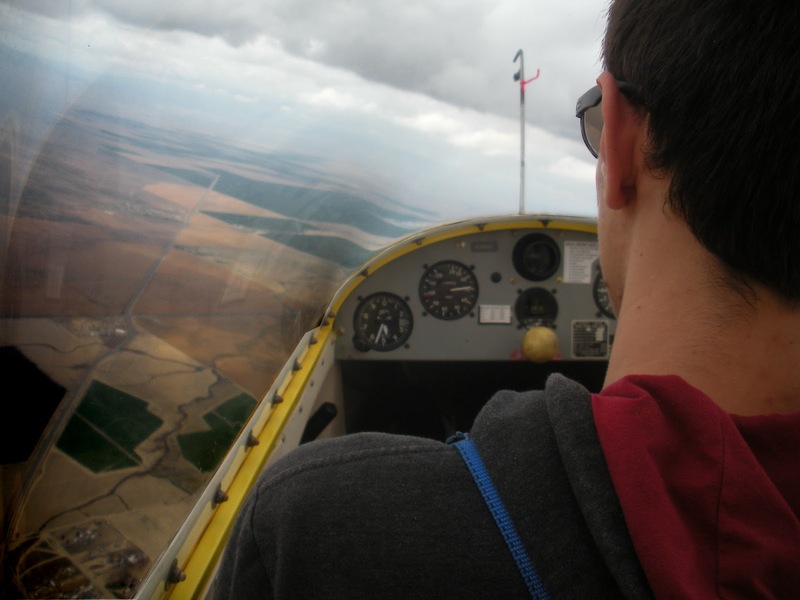 A cool, comfortable, smooth, and surprisingly long flight in a gentle rain. Absolutely nothing exciting or challenging, but very relaxing and enjoyable. Much better than not flying! 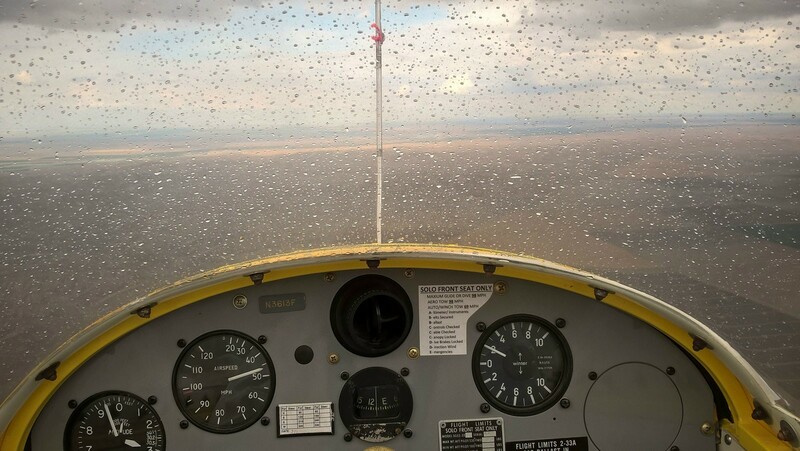 Jim Rickey's photo of the rain he encountered at various times during his flight. A tiny glider against a massive sky. Humbling to be sure. Jim Rickey looks higher than 3100 msl. Jim wandered around looking for a sunny hole in the clouds but found none. In spite of the overcast it was a fun day for those few who ventured out here. 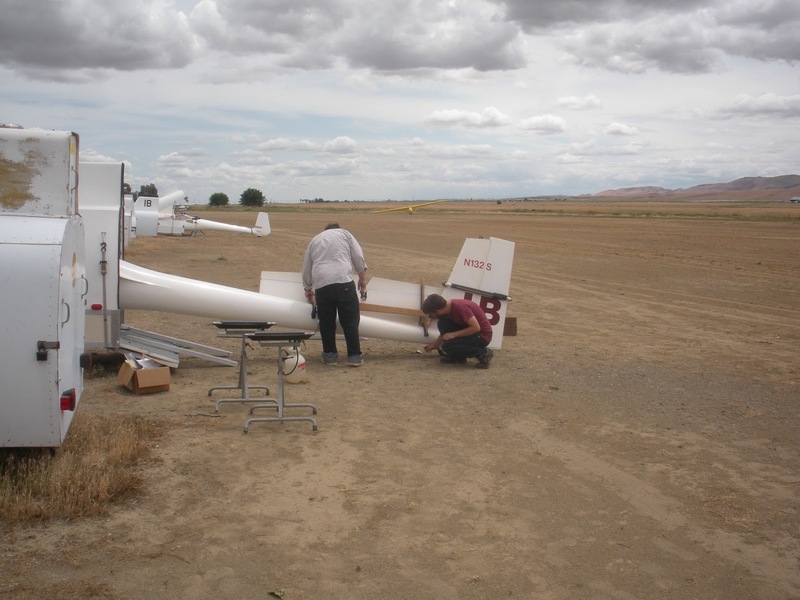 Richard Walker was working hard preparing even better tie downs for the 2-33's, going so far as to install a steel bracket in concrete for the tail section of the gliders. But that's Richard who always seems to be doing something to benefit the club. Thanks Richard on behalf of all of us in the club. Mike Paoli was also here working on his Libelle, then helping Richard with the tail tie down bracket. Mike's another member who always seems to be doing something around the field that benefits the club. Thanks also to you, Mike. Finally thanks to Jim Rickey who towed all the rest of us, then finally got in a good flight in Big Bird just before any rain hit the field. SATURDAY, May 21, 2016. A lot of fun flying.